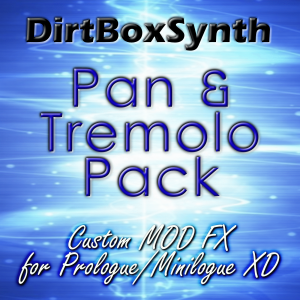 This pack includes two custom MOD FX files – Panner and Tremolo, for adding volume-based effects autopan and tremolo/gate. Both effects use Depth and Speed as you might expect, with the exception that the Depth knob is divided into two halves. The first half of the knob selects a sine-wave LFO, varying in depth from zero to full. Beyond the mid-way point, the LFO changes to a square-wave, and the depth starts from zero again. Using a square wave on the tremolo will produce a regular gating effect. However, this cannot sync to BPM and is under manual control only.